Thanks for posting that! Now I remember you do not have the couch, you had the hole above the refrigerator. you inspired me to start cutting holes in walls and finding hidden spaces! Thank you thank you thank you! If you could put your Fun Finder handle on your blog somewhere maybe it would come up in a Google search. I looked for it the other day and didn't find it. I like the wire mesh idea I will have to look around and see what I can find to do with mine. Liz, that is a great idea -- I should put my screen name, profdant139, into both of my blogs, so that people can search for that, rather than the name of the blog. Thanks for the tip! Did similar on my new/used 210UDS. 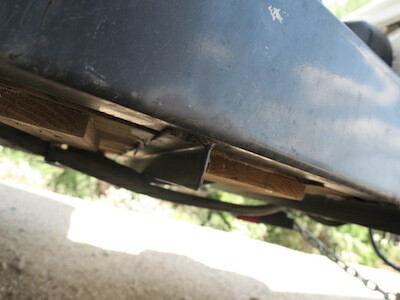 Had welder remove existing battery rails and weld three new angle-iron cross braces under the frame. I cut and installed inexpensive redwood fence slats (glued on, no maintenance, drains well). 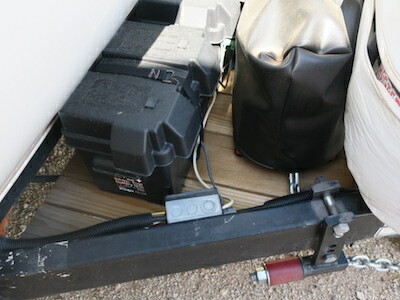 Made enough room to add a battery and carry my Honda 1000 emergency generator behind the propane tanks. 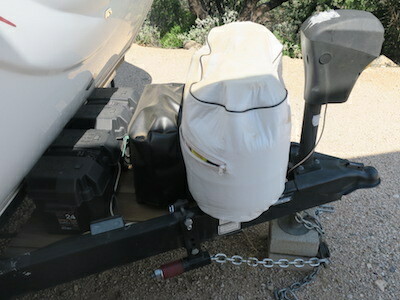 Also down-graded to 20 pound propane bottles and use a soft-side cover to reduce weight (easier for me to carry and offset the added weight from new battery and generator). Also use Andersen weight distribution/anti sway hitch that weights, including ball, under 60 pounds (and no bars to man-handle, store). Excellent solution to this problem -- redwood! I thought about wood but was concerned about deterioration due to water exposure. But clear heart redwood should do just fine.